Freezer 2 wingEverzen UDS-25RIR - a modern device,integrating multiple functions to keep food cool and fresh. Equipment is imported 100% from Korea. Today,freezer is an essential device in many small and medium restaurants,cafes .There are many different kinds of freezer about origin, material, style ... But the most popular is freezer 2 wing. - Freezer 2 wings has the advantage of compact,suitable for a restaurant with small kitchen space, storage need is not too big . 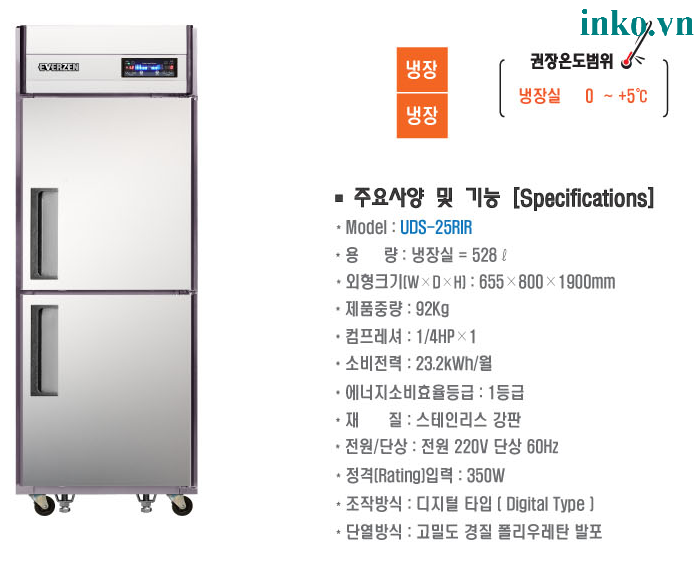 - Freezer 2 wings Everzen 2 UDS-25RIR with the advantage of high durability,are made of luxury stainless steel materials, easy to wash.
- Installing opening bell:there will be beep if the door is opened in a while,and knoll a few seconds later until the freezer is closed .